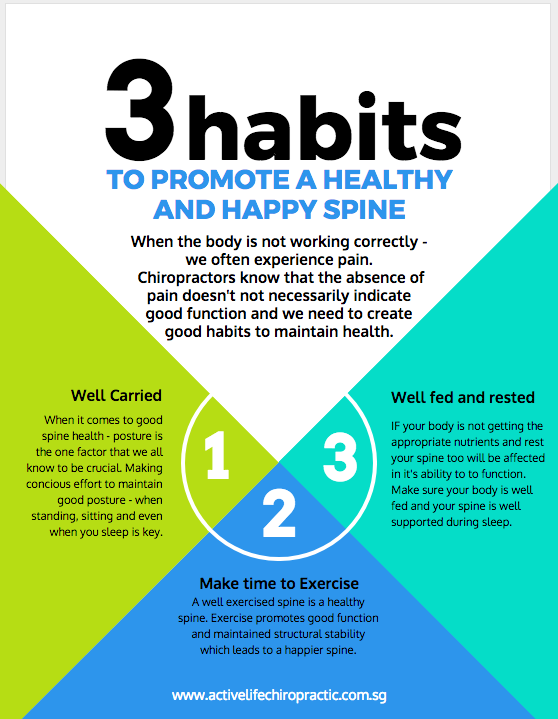 Healthy Spine Habits start with you! We all know the healthy importance of taking care of our health. We regularly maintain our bodies to ensure of that. Whether that is brushing your teeth twice a day, staying hydrated or protecting our skin from the sun, it becomes second nature. Time and time again our Doctors at ActiveLife Chiropractor Novena and ActiveLife Chiropractor Orchard hear from patients who spend so much time caring for their bodies – but neglecting to take the time to care for their spine. The tips outlined above are just the surface of habits that can help maintain a healthy and happy spine, but start with simple and your body will thank you later. If you know that it’s been a while since your last visit or are looking for Chiropractors in Singapore – call our staff to schedule an appointment today.